Monitoring storage controller performance, or diagnosing a performance issue, is simplified by starting with a high-level picture of controller metrics to determine where to focus (i.e. 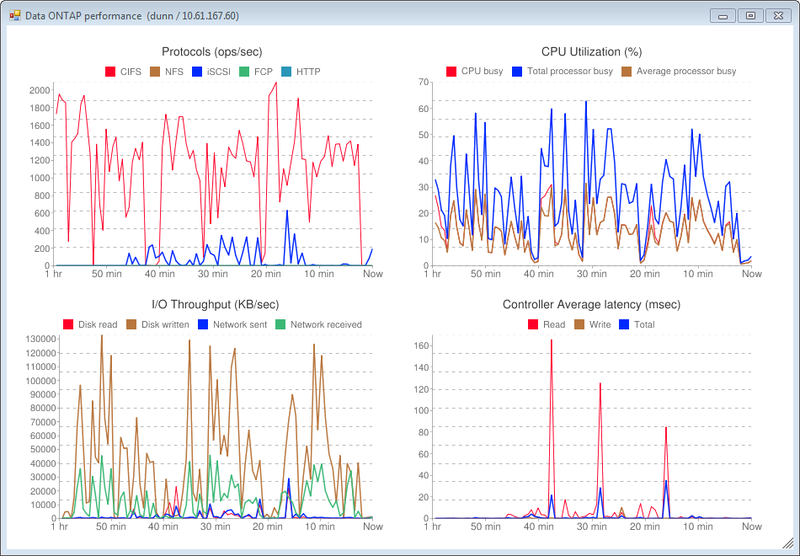 I/O demand, CPU bottlenecks, controller latency, network or disk traffic). The attached script leverages the Data ONTAP PowerShell Toolkit, the Windows Forms API, and the Google Chart API to create controller performance graphs. The graphs scale dynamically, update every 20 seconds, and display one hour of data. The host running the script must have Internet connectivity. Toolkit 1.2 is required. Thanks. This looks like a great script and something I will definately be using to monitor the performance of the filers in our enviroment. For NetApp novices, links to performance troubleshooting guides would be useful to have as well on this post. does this PowerShell script work with NetApp toolkit v3.0 ? Does your script support Cluster-Mode or only 7-mode?